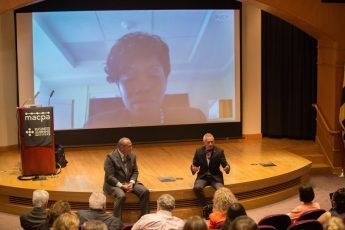 Hundreds of MACPA members gathered June 21 at the association’s Annual Meeting (with hundreds more participating in an online simulcast) to celebrate successes in the profession and among our leaders. The event capped off a year of major developments from the state, national, and international levels in the accounting profession. The Annual Meeting was preceded by a town hall meeting / professional issues update, featuring presentations and brief Q&As with incoming AICPA Chair and former MACPA Chair Kimberley Ellison-Taylor; MACPA board member Ken Kelly, who chairs the association formed by the joint venture of the AICPA and CIMA; Maryland Board of Public Accountancy Chair and former MACPA Chair Art Flach; and Daniel Burrus, the leading futurist and New York Times best-selling author who created the Anticipatory Organization: Accounting and Finance learning program offered by the MACPA and the Business Learning Institute. Other speakers and award winners were also featured. MACPA CEO Tom Hood opened the professional issues update by noting the ways in which the MACPA helps make its members future-ready. Chief among these initiatives are connect members to innovators in the profession, develop training on how to anticipate and adapt, and engaging members in envisioning their future. This work is done alongside our mainstay mission to Connect, Protect, Achieve. Ellison-Taylor will make history when she is installed later this year as the AICPA’s first African-American chair. She will also be the youngest chair in AICPA history. Joining the MACPA program via Skype, she thanked the MACPA for “planting the seeds” for her professional growth in encouraging her involvement, first in the state organization and later as MACPA chair. 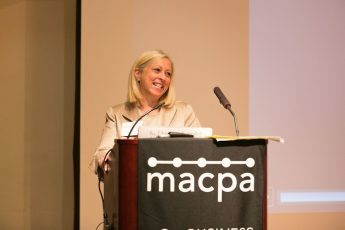 At the national level, she recognized the MACPA’s leadership role in the profession and that of Hood and other board and staff members who have served in key advisory roles within AICPA initiatives in diversity and inclusion, learning, and more. She emphasized the AICPA’s initiatives in support of the CPA license and brand, and in developing the student and young CPA pipeline. 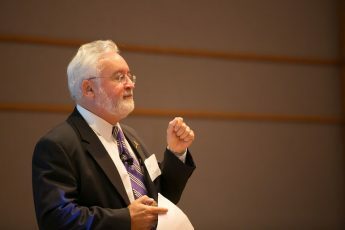 Kelly recapped the historic vote of 86 percent of AICPA members and 89 percent of CIMA members in favor of furthering the joint venture between the two organizations, bringing under one umbrella 600,000 members across the CPA profession and management accounting, leveraging strength and opportunities of the combined organization, while maintaining separate membership bodies. Flach emphasized the need for accountants to pay attention to the Department of Labor’s critical report on employee benefit plan audits. He also noted that CPAs are risking their license by presenting their CPE requirements as fulfilled when indeed, if audited by the Department of Labor and Licensing, it is found they are not. Another concern he noted is the number of DWI and DUI cases that come before the Accountancy Board. Although many know they risk their driver’s licenses, they may also lose their CPA license upon a second occurrence. He urged CPAs to tell their colleagues to “Uber it” rather than drive drunk or under the influence. 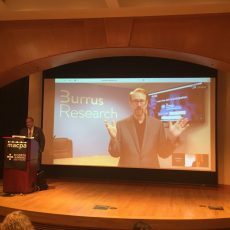 Burrus, a leading consultant at Fortune 500 companies and author of best-selling books on anticipating future trends rather than being disrupted, joined the meeting via Google Hangout. He emphasized, “Your customers are transforming; are you?” Having worked with IBM on developments relating to IBM Watson and artificial intelligence, Burrus advised that it’s not enough to be agile, since agile is reactive. Rather, we have to be anticipatory to be proactive. In addition, Burrus noted that everyone is trying to move with exponential speed, “but what if you are moving exponentially in the wrong direction?” The MACPA and BLI bring you the best of Burrus’ award-winning Anticipatory Organization program, customized for accounting and finance professionals. Learn more about how you or your firm can take advantage of this online course or customize it for groups or special events at blionline.org/ao. 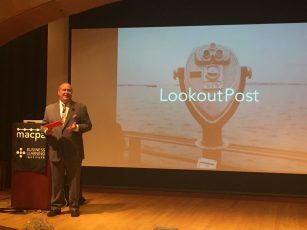 Outgoing MACPA Chair Mike Manspeaker reviewed a year of strong legislative advocacy work on behalf of CPAs in audit, business and industry, and the broader business community. 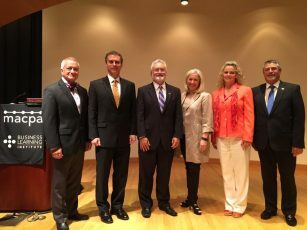 He highlighted major initiatives recently launched, including the launch of the AOAF program with Daniel Burrus. 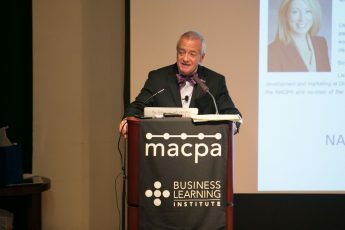 Additionally, Manspeaker recognized the success of the MACPA’s staff, working in collaboration with Blue Ocean Ideas, in moving MACPA functions into the cloud and recently launching the exciting update to the website, macpa.org. 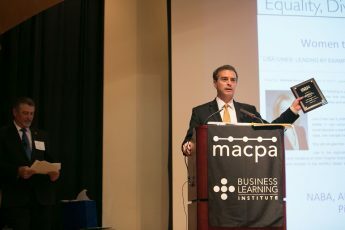 Manspeaker announced that Maryland Sen. Brian Feldman, CPA, was the recipient of the Max Teichmann Award, given to the MACPA member who exemplifies service to the community. 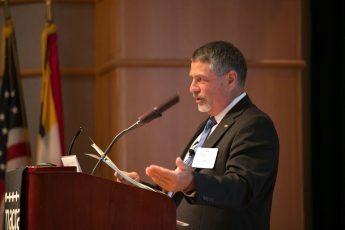 Feldman thanked the MACPA and its members, noting they play a respected and important role in Annapolis, with Hood and MACPA members testifying on bills in the Chamber noted for their credibility. The MACPA has been at the forefront of diversity and inclusion initiatives at the state level and has participated in AICPA initiatives as well. 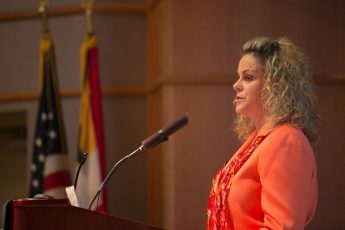 Samantha Bowling, chair of the MACPA’s Equality, Diversity and Inclusion Task Force, noted that MACPA initiatives include the annual Women to Watch event (this year slated for Sept. 30), a mentoring program, and featured stories in the MACPA blog. Capping off the program was the presentation of the gavel to Lisa Cines, elected as the MACPA’s 2016-17 chair. Together with the rest of the board, Cines will lead the MACPA as it continues to represent the interests of Maryland CPAs at home and on the national and international stage. Newly installed board members include Avonette Blanding, Wally Boston, Bob Jirsa, and Ray Speciale. Newly installed officers joining Cines include Ken Kelly as vice chair and Samantha Bowling as secretary / treasurer. Newly installed members of the MACPA’s Nominating Committee include MACPA past chair Allen DeLeon, Kathy Burkey, and Amy Myers.